I’ve wanted to go to Athens and see the Acropolis since I was eleven and my drama teacher started us on Greek tragedies. So when a university study trip of ten days based in the ancient city was offered to me I jumped at it like a shot. My mother was so jealous that in the end we came to Athens with my father a few days before the trip was due to start. Note to the reader: a loose skirt in high winds leads to sartorial adventures you could probably live without. Still despite my not-so-graceful Marilyn Monroe moments we were glad of the breeze as we wandered from our hotel to the legendary rocky outcrop of the Acropolis. One of the added advantages of travelling with my parents is that we tend to stay in a very different class of accommodation than I ever book myself in to. We had arrived the night before and got a taxi to our hotel in the city centre. There’s a flat rate of €35 from the airport to the centre so don’t worry about dodgy metres. The Electra Palace (my mother’s favourite mythological figure – don’t think that doesn’t speak volumes) has the kind of wide marble lobby that instantly makes you feel under-dressed. It is designed to sweep. We ate that evening in the roof top restaurant looking across to the flood-lit acropolis. The outdoor pool with dolphin mosaic shimmered on the terrace below. There may be no such thing as the perfect introduction to a city, when cities are such vibrant and complicated things much like people, but this was damn close. But back to me trying to keep my skirt on while looking up at one of my personal wonders of the world. 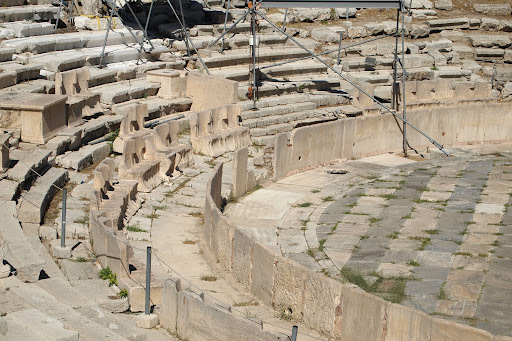 There had been no wind down on the south slopes of the acropolis at the Theatre of Dionysos (the oldest theatre in all of Greece that survives) but that had left the dead heat unchallenged so I mostly looked at things while scurrying between patches of shade. All the world’s a stage, perhaps, but this particular bit of the world had been a stage for a very long time. Hundreds of thousands of voices had lifted in the words of Aeschylus, Euripides and Sophocles and hundreds of millions of ears had listened. 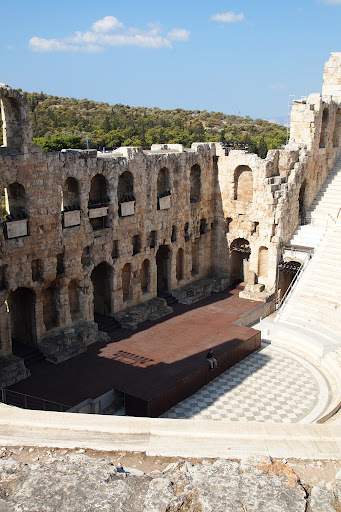 The later Roman Theatre was grander, more impressive and built by the infamous Herodes Atticus who had peppered Roman Greece with his building projects. This particular theatre was built in honour of his late wife while her brother sued him with accusations that he had murdered her. But it was so modern looking, so practical a theatre that I think it lost some of the magic for me. Silly but true. The Sanctuaries and fountains that crowd against the slope were almost lost on me that day in the heat but luckily I got another chance when I returned days later with my group. That day our goal was clear; make it to the top! As we got higher the path grew narrower and the crowds became denser as they surged over the eroded stone that radiated heat as the morning blazed its way towards noon. The Parthenon loomed. It isn’t a building that stands. It is politics made solid, as my lecturer Sue O’Neill would say. It was a people’s chosen way to fix their point in time forever with a monument. 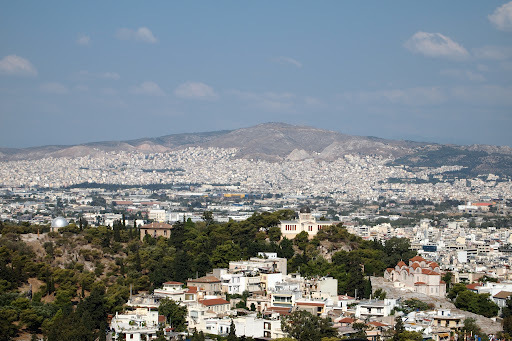 The view over Athens to the sea and around to the mountains was the definition of panoramic. 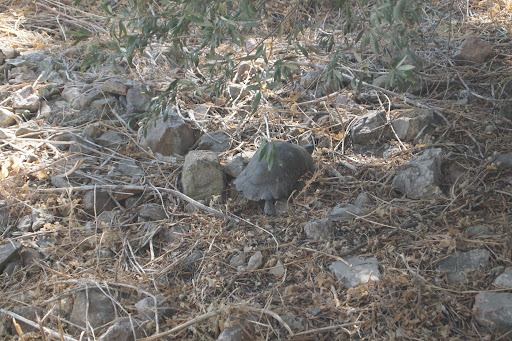 We descended into the Athenian agora, or marketplace, bumping into the first of many tortoises we were to meet around the city. 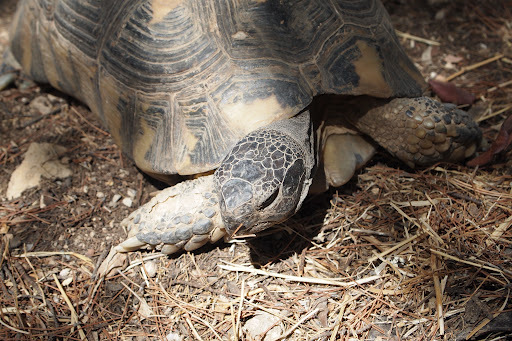 But I’ll tell you more about the agora when I get to my second visit. 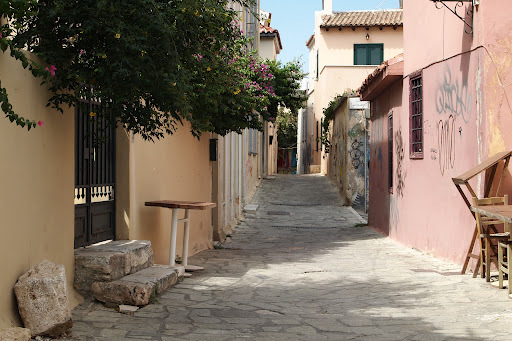 Then, avoiding the hills for the sake of my mother’s knee which had had strain enough for the day, we made our way through some smaller, less crowded streets towards the new Acropolis Museum. It was nice to get away from the visiting masses swarming about and stroll around a more relaxed part of the city. 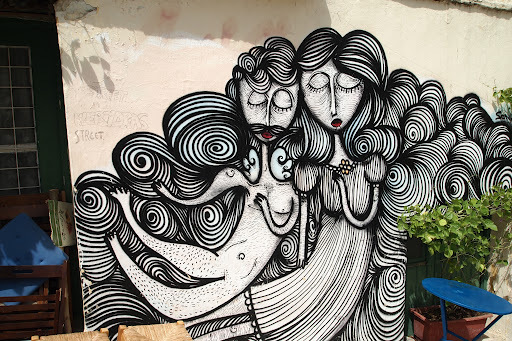 This was also where I first got interested in Greek graffiti culture. 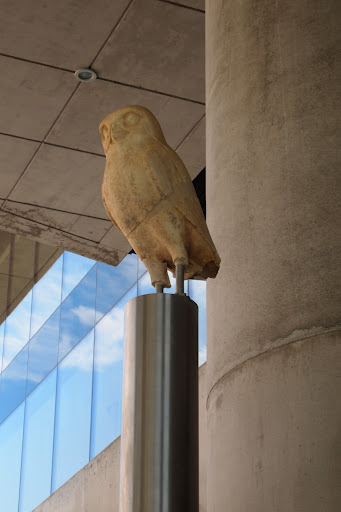 The New Acropolis Museum, with two fingers cocked at the British, is striking before you even get inside. It’s construction revealed layers and layers of ancient Athens now exposed through its glass floor. Look out for the mosaic as you go over. Again it’s free for students and the museum is open until eight. The exhibit is laid out almost more like an art gallery than a museum. 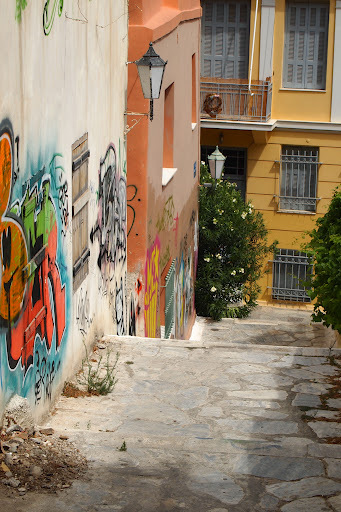 It starts with things found in the smaller sanctuaries of the slopes of the acropolis like the Temple of Asclepius. 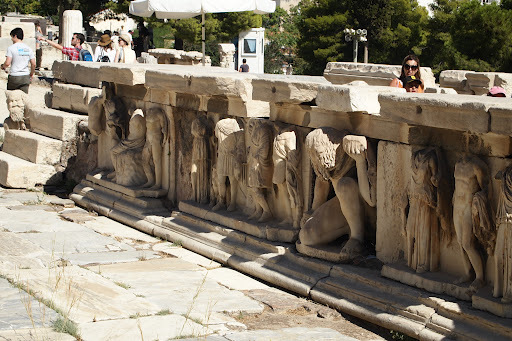 At the top of the ramp are the sculptures of an older temple to Athena before they built the Parthenon. They were excellently preserved as due to their status as sacred items they were buried ritually. Then you wander through the gallery the arrangement of the statues. 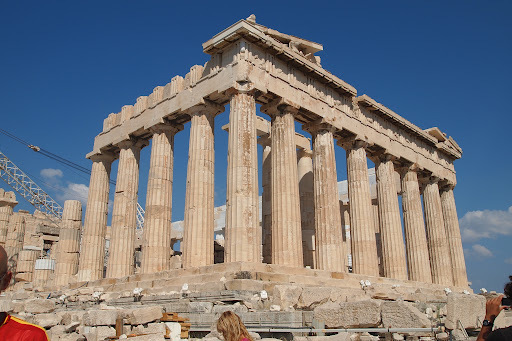 The top floor is the same size and dimensions as the Parthenon and has the sculptures that remain in Greece. There are plaster casts to replace the ones still in London. This was pretty controversial die to the endless battle between Athens and London over the Parthenon marbles removed by Lord Elgin. While I do believe that sometimes archaeology needs to be removed to preserve it, I also believe that unique items of a countries heritage should be returned wherever possible. Archaeological ethics are a pretty complex business. When can something be considered as having universal importance to human heritage? And colonial countries did often save things that might have been lost but it is equally understandable that once a country gains its independence it would want those artefacts back. But now that I’ve been to both exhibits I really do feel that the Parthenon marbles should be reunited and would be more interesting in context. The museums free standing statues include notes on how they would have been painted at the time. It’s a bittersweet sort of interesting to think that these elegant white marble sculptures would have been painted in garish shades of red and blue. There are two museum cafes with the same menu. One is on the ground level on the glass floor looking into the ancient city below. 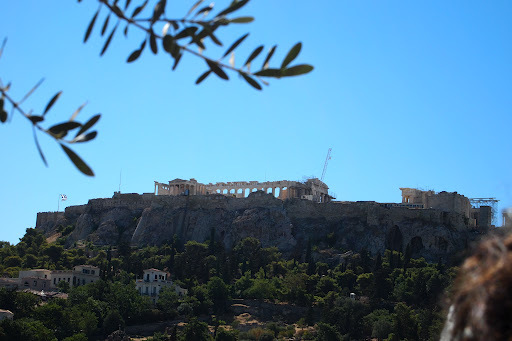 The other is on a roof terrace on the third floor that overlooks the Acropolis. Try the baked feta with thyme honey; seriously! We wandered back to the hotel down a long shopping street called Adrianou. Mixed in with all the tourist tack are some genuinely nice shops. There was a Taberna too, about half way down with two Greek guitarists playing traditional tunes at the door. The best way to eat here is to share. Order the eggplant (aubergine) salad to dip your bread in (if you like garlic). Baked feta with pepper and tomatoes is another good choice. I never sleep when I travel. I don't want to miss a scene that only God knows if I would see it again. I often go to bed late and get up early but I travel too much not to sleep I'd go mental.